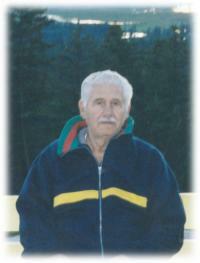 George Kotronis of Edmonton passed away peacefully surrounded by his family at the age of 85 years. George will be lovingly remembered by his wife Anna of 61 years; children Jim (Hilda), Evdoxia (Petar) Zagorac and Ted (Angela); grandchildren Anna (Trevor), Ted (Jordana), Jennifer, George, Diana (David), Alexis and Nicholas; five great grandchildren; family and friends. He was predeceased by his parents Demitrios and Evdoxia and his sister Kleopatra Kosifidou. The Prayer Service will take place on Sunday, July 28, 2013 at 3:00 p.m. at Foster and McGarvey Funeral Home, 10011 - 114 St., Edmonton. A Funeral Service will be held at St. George’s Greek Orthodox Church, 10831 - 124 Street, Edmonton on Monday, July 29, 2013 at 11:00 a.m. The Funeral Home Bus will be available to transport family and friends to Westlawn Memorial Gardens for the interment and back to the Church for the Reception. In memory of George, donations may be made to St. George’s Greek Orthodox Church.